This historic railway built between 1910 and 1915 is still operating as a tourist train, and still uses a steam engine built in 1912. It offers regular rides and special rides like the Great Train Robbery. The Kettle Valley Railway was built to connect the Okanagan Valley to the ocean – a “Coast-to-Kootenay” railway, in the words of local advocates. It would ship fruit out of the Okanagan, and connect to key mineral and ore deposits. Plans had been raised in 1901, but nothing came of it until Ontario lawyer J.J. Warren and Canadian Pacific president Thomas Shaughnessy struck a deal in 1910. They entered into an alliance in which the Kettle Valley Railway acted as a subsidiary corporation of CPR to help expand the train routes into southern British Columbia. One of the engineering marvels of the line is the Trout Creek Trestle Bridge in Summerland, which stretches 619 feet across and 238 feet above the canyon floor. It consisted of a steel truss with two trestle approaches. The bridge was upgraded in 1927 and 1928 by replacing the trestles with steel girders. It was the third largest trestle bridge in North America when it was constructed. The KVR consisted of 500km of track over and through three mountain ranges. Passenger service ceased in 1962 and freight service ended in 1989. 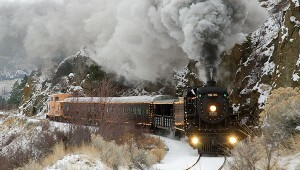 Now, a portion of the track is kept operational by the non-profit Kettle Valley Railway Society, which uses it for 90-minute train rides on a historic steam engine, the No. 3716.